Classes and workshops offered in Beijing and major cities in China. www.alwaysinstyle.cn. Go Beyond Fashion and Learn What Looks Best on You. 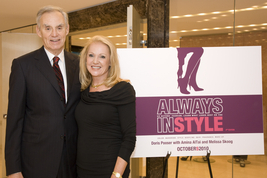 Learn everything you need to know to look great and feel confident in any situation, from the boardroom to a first date by understanding fashion and making the most of your look and lifestyle. 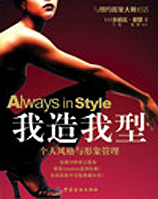 New updated and revised edition of Always In Style. Make the most of your unique style. Save time and money by looking and feeling your best. 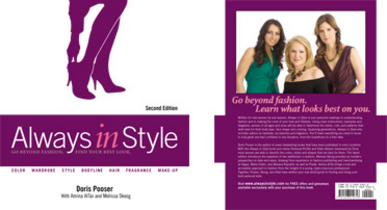 Written for real women by real women, Always in Style is your personal roadmap to understanding fashion and to making the most of your look and lifestyle. Using clear instructions, examples and diagrams, women of all ages and sizes will be able to determine the styles, cuts, and patterns that work best for their body type, face shape and coloring. Spanning generations, Always in Style also includes advice on hairstyle, accessories and fragrance.